For the 24 hours to 23:00 GMT, the EUR declined 0.23% against the USD and closed at 1.1318. Data showed that the Euro-zone’s flash consumer price index (CPI) advanced 2.2% on an annual basis in October, notching its highest level in 6 years and in line with market expectations. In the previous month, the CPI had recorded a rise of 2.1%. Moreover, the region’s unemployment rate remained unchanged at 8.1% in September, hitting its lowest level since November 2008 and at par with market expectations. Additionally, in Germany, retail sales unexpectedly eased 2.6% on a yearly basis in September, confounding market consensus for a gain of 1.0% and marking its abrupt decline since June 2013. In the preceding month, retail sales had registered a climb of 1.6%. In the US, data revealed that the US private sector employment climbed more-than-estimated by 227.0K in October, following a revised advance of 218.0K in the prior month. Market participants had anticipated the private sector employment to record a gain of 187.0K. On the other hand, the nation’s Chicago Fed purchasing managers’ index dropped to a level of 58.4 in October, for the third straight month and more than market expectations for a decline to a level of 60.0. The index had recorded a level of 60.4 in the previous month. Also, the MBA mortgage applications fell 2.5% on a weekly basis in the week ended 26 October 2018, following a rise of 4.9% in the prior month. In the Asian session, at GMT0400, the pair is trading at 1.1346, with the EUR trading 0.25% higher against the USD from yesterday’s close. 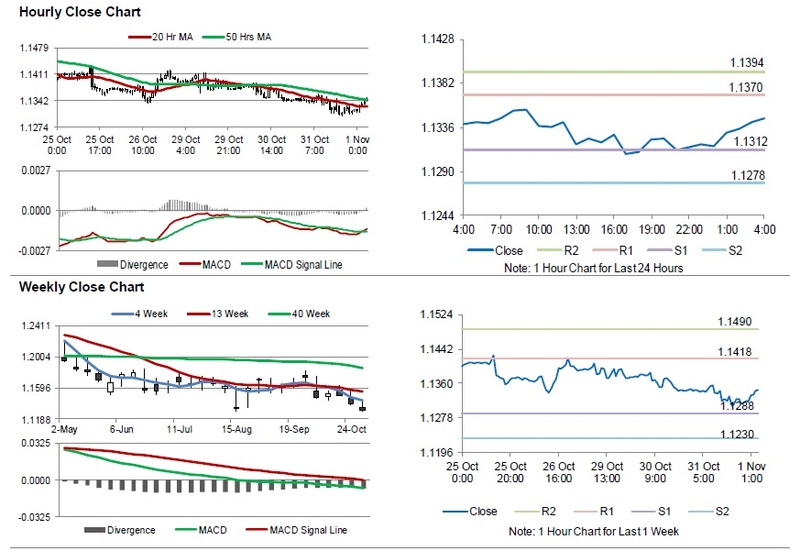 The pair is expected to find support at 1.1312, and a fall through could take it to the next support level of 1.1278. The pair is expected to find its first resistance at 1.1370, and a rise through could take it to the next resistance level of 1.1394. Amid lack of macroeconomic releases in the Euro-zone today, investors would look forward to the US initial jobless claims followed by the Markit manufacturing PMI, the ISM manufacturing and ISM employment, all for October, set to release later in the day.